So, this exists. 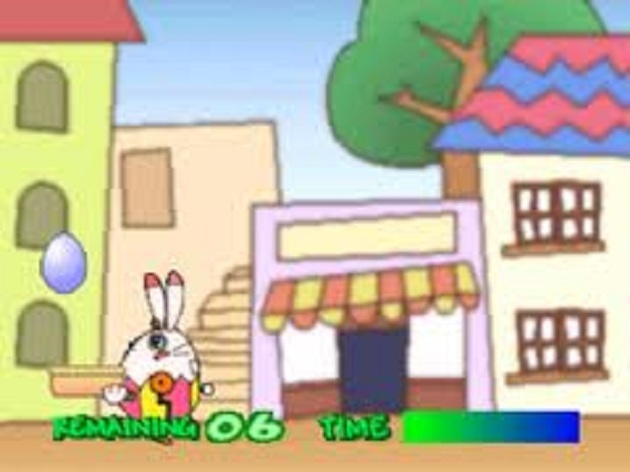 “This” meaning a game centered around a robotic bunny who bursts from an egg and solves puzzles to save Easter. In some universe, it probably makes perfect sense. There are middling other mini-games, one based on the Atari 2600 classic Kaboom, although with only a smidgen of the play value. Memorization type interruptions are here too, the most menial tasks for a kid to stay busy and let the parents have some time off in other words. Monotonous music is done in such slim fashion, it finds itself repetitiously cycling before tasks are even a tenth complete. Two players can work together solving these non-Easter themed puzzles, as if that’s the best thing kids could be doing on a holiday. There is one thing of note about Easter Bunny’s Big Day: it is the only US PlayStation game without a black spine. It’s purple. Thanks for standing out Big Day. Us collector’s appreciate it.